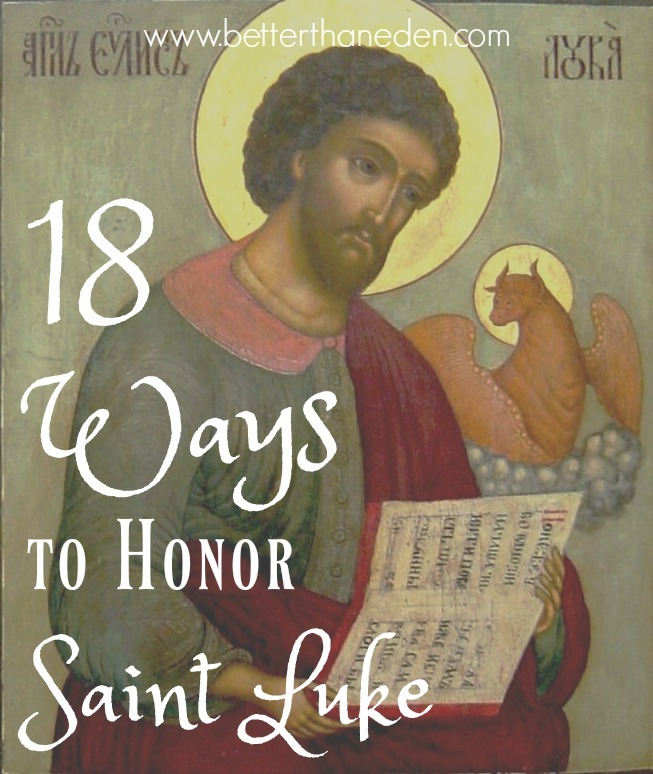 On October 18 we celebrate the feast of the great evangelist Saint Luke. Without him or the other Gospel writers, can you even imagine? The world as we know it would be so very different! We owe so much to all of them and are so in debt to the ways that they listened to the Holy Spirit and shared with us the life of our Lord. The symbol for Saint Luke is the ox. He was an unmarried man who devoted himself to the spreading of the Gospel with Saint Paul and recording the life of Christ and the early Church. He is thought to have had a close relationship with Mary since there is so much in his Gospel from her perspective. He was an educated Greek, trained as a writer, a physician, and an artist who lived to the old age of 84. He may have been martyred but it's unclear whether that's true or not. 1. Get to Mass. (Y'all knew that would be first, right??) But it's true that the best way to observe the liturgical year is through worshipping with the Body of Christ in the liturgy. It should always when possible be the default and primary way to celebrate the liturgical year. 2. 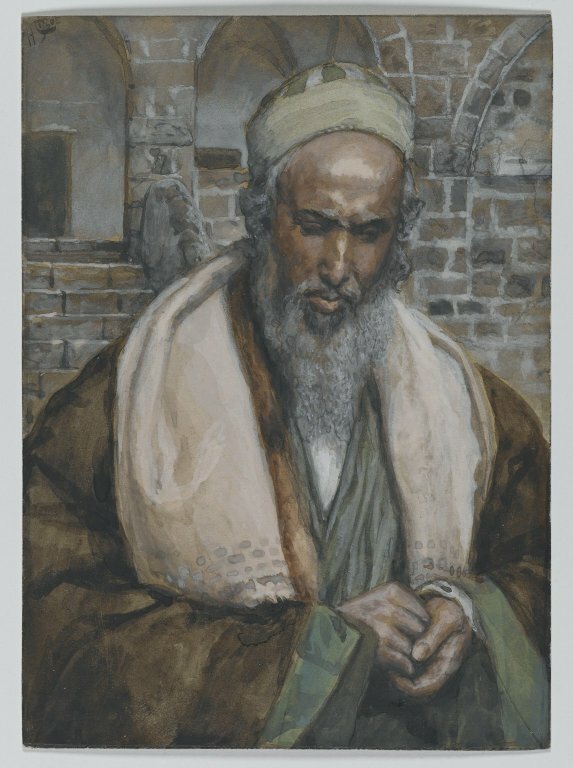 Read from the Gospel of Luke and/or The Acts of the Apostles, both of which were written by the evangelist. 4. Visit the doctor. Really! Okay, fine, maybe not for an actual appointment but perhaps a quick stop by to drop off some homemade thank you cards from the kids. If that sounds undoable, you can simply send an email to those medical professionals thanking them for the good work that they do to serve your family. And, of course, say an extra prayer for any physicians that you know! 5. Have oxtail for dinner. If you can't find oxtail which is just a certain cut of the cow, any nice cut of beef is suitable, I think. Not only is his symbol the ox but he is the patron saint of butchers! 6. Ooor incorporate some Greek food into your dinner. The evidence points to St. Luke being a Greek so perhaps some slouvaki or gyros or olives or adding some pita bread to your dinner would be an easy way to celebrate. How about some Greek yogurt with honey for lunch or dessert? 7. Pray the Magnificat or play and sing with one of the beautiful songs based on it. This stunning and timeless prayer from Mary is only known to us because of Saint Luke! 8. Read Saint John Paul the Great's Letter to Artists. It's beautiful for anyone but every Catholic writer or artisan should be sure to read this great work. 10. Pack a first aid kit for the car or house. Let the kids help think up and fetch items that should be included. 11. Visit a local art museum. Or find a local art shop or sculpture park to visit! 12. Pray the Joyful Mysteries. St. Luke's Gospel is the only Gospel where we get the entire conception and birth narrative of Jesus - the Annunciation, the Visitation, the Nativity, the Presentation, and the Finding in the Temple. What a gift he gave to the world by following the Spirit and writing these down! 13. Finally buy that piece of sacred art for your home that you've been eyeing up and wanting to hang. 14. 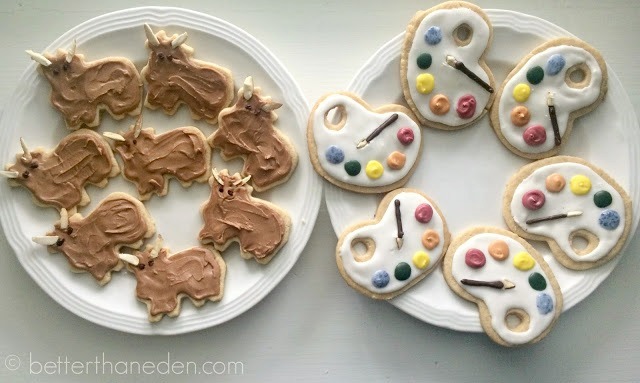 Make some homemade play dough and let the kids sculpt. St. Luke is also the patron saint of sculptors! 15. 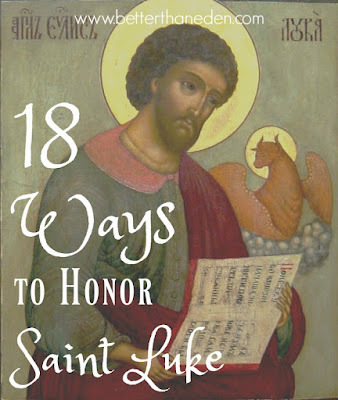 Take some time to learn about, admire, and venerate the icons of Mary, that tradition has attributed to Saint Luke himself. 16. Bring out the candles! The name Luke means "Light Giver" so perhaps lighting some extra candles with dinner or even making some baby jar votive holders or rolling some candles would be a good backdrop to think and talk about what it means to bring the light of Christ into the world. 17. Make something beautiful just for the sake of it. Whether you revisit an old skill, try a new craft, or simply put some extra time into setting the table beautifully for dinner, consider it your "art" for the day. Beauty exists for its own sake and it brings glory to God. Our efforts at creating beauty for the world is a reflection of the image of God within us. Find your art. 18. Pray for some of the bachelors you know. 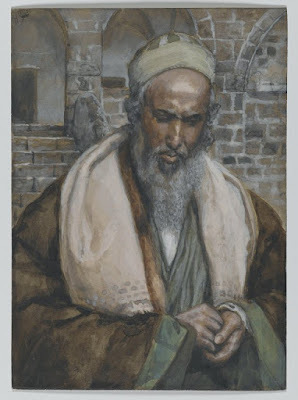 St. Luke is also considered one of the patrons of unmarried men. Consider offering some prayers for those men you know, praying for their vocations and holiness. Better yet, pray for him AND invite him over for dinner! May the great Saint Luke pray for us! My husband loves oxtail soup! ;) Great list! These are doable! Thanks for a great list, Mary. LOVE THESE! Will be doing something from this list today! Thank you, Mary!